Another construction worker lost his life recently and a second worker was injured when a 30-foot wall collapsed at the site of a casino being built at a mall in Baltimore. Both accidents happened in Anne Arundel County, according to The Baltimore Sun. Rescue workers arrived on scene at the site of the Maryland Live! Casino located near a mall in Hanover last Friday morning. According to police, one worker was pronounced dead on scene and the other worker was taken to Shock Trauma with life-threatening injuries. The accidents are being investigated by Maryland Occupational Safety and Health. This is the second accident at the site this month. Construction workers are at a high-risk for injury on constructions sites this summer. Another common injury that is likely to occur if the proper precautionary steps are not taken is a heat-related construction accident in Massachusetts. As we continue to experience record-high heats, workers are warned and asked to keep cool and safe through the remainder of the summer. Our Massachusetts workers’ compensation attorneys understand that these workers face potentially fatal hazards on the job every day. It is the responsibility of their employers to make sure these sites as safe as possible and to take all the precautionary steps available to prevent these injuries. These preventative measures are especially important during the summer season as construction workers are working hours a day in high temperature heats. The Maryland company is in charge of building a 4,750-machine slots parlor and entertainment complex called Maryland Live! Casino. The casino was expected to open by the end of 2012. A number of legal challenges have delayed the project though, which kicked off earlier this year. It is going to include the casino, restaurants and a live music venue. “Our thoughts and prayers are with the workers and their families,” said Megan Slattery, the construction company’s spokesperson. 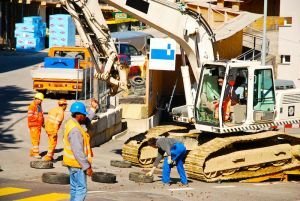 As we’ve previously discussed on our Massachusetts Workers’ Compensation Lawyers Blog, heat-related injuries are quite often in the construction injury, especially during the summer in Massachusetts. Workers are asked to keep an eye on one another when laboring under the summer sun. Severe, sometimes disabling, cramps, usually in the hands, calves, or feet. Often pale with cool, moist skin. Headache, weakness, thirst, and nausea. Core (rectal) temperature higher than normal, usually more than 100 F (37.7 C) and increased rate increased. Employers are reminded to provide workers with plenty of shaded rest time and with water about every 15 minutes. Try to get the more difficult jobs done and out of the way earlier in the day. Try training new employees in increments, exposing them to period of heat a little at a time. Remember, the Bureau of Labor Statistics (BLS) reports that were more than 200 heat-related deaths from 2003 to 2009. A large majority of these deaths happened in the construction industry. During those same years, there were nearly 15,500 heat-related injuries and illnesses that required employees to lose days at work.